Senator Ameh Ebute, former Senate President in the Third Republic, says Senate President Bukola Saraki is “barren of every essential ingredient and honour to continue to preside over any parliament anywhere in the world”. He therefore asked Saraki to “please withdraw your membership of the National Assembly by resigning your position”. Why is he asking Saraki to vacate office? 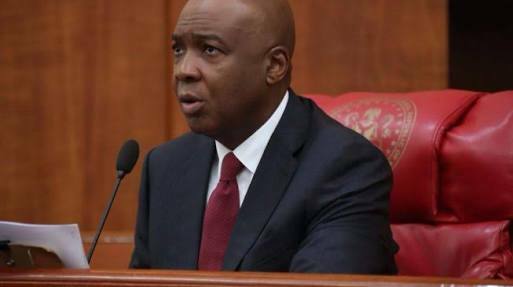 In an open letter to Saraki, which he released to newsmen on Friday, he accused the leadership of the current National Assembly of importing despicable autocracy and despotism into parliamentary engagements. He also lamented that by protecting the abominable and despising the truth, the Senate President has succeeded in turning the Red Chamber into a combat theatre. “Your leadership of the Senate has shown an absolute proclivity to vindictiveness and witch-hunting of colleagues who share views opposed to your disposition. Such members are goaded to the Ethics and Disciplinary Committee peopled by your acolytes, who have accepted the loathsome job of serving as your hatchet men. They unduly or unlawfully punish dissenting voices for the audacity of holding an opinion contrary to your thinking. “The suspension of Senators Ali Ndume and Omo-Agege are some of the few examples of your aberrational leadership of the Senate and the National Assembly. You have turned the Red Chamber into a combat theatre, protecting the abominable, but despising truth. This is the extent of your moral deficit, which has disqualified you from belonging or even leading an assemblage of honourable men and women. “Sir, in my humble opinion, you are barren of every essential ingredient and honour to continue to preside over any parliament anywhere in the world. The abysmal performance of the Senate under your watch, the padding of national budget or the simmering regime of corruption your leadership has allowed to creep into the Senate strips you of any qualification to be a member of Nigeria’s National Assembly. “Nigerians have tolerated your leadership deficit enough and time has come for you to have a rethink and do the needful. We are tired of your scandalous outings at every point. It is either, you are fingered in armed robbery today, or some illicit monies are traced to your account abroad, which are matters the laws of the Federal Republic of Nigeria does not approve of any public office holder.